This Demonstration shows the change of light intensity when light passes between two dielectric media, making use of the Fresnel equations. The red light beam ( ) represents the light perpendicular to the plane of incidence; the yellow light beam ( ) shows the light parallel to the plane of incidence. 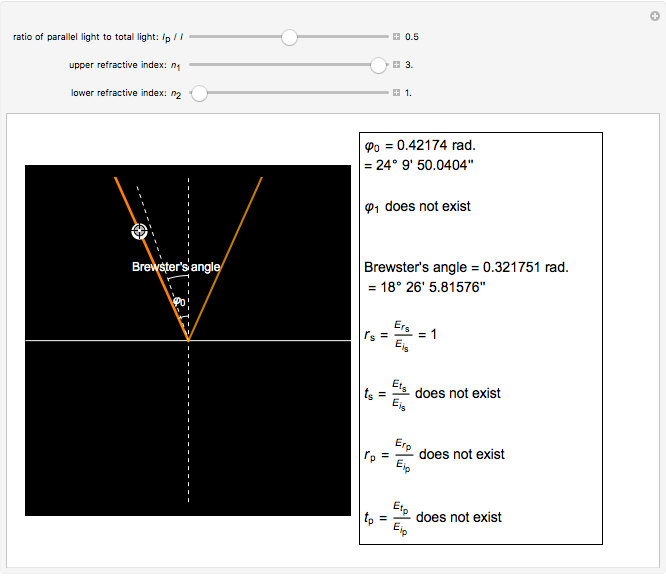 Using the slider, you can change the intensity ratio of the light parallel to the plane of incidence to the total intensity. This will also show the blend of the two colors representing the mixture of lights in the two directions. As light is transmitted and reflected, the intensities of both beams change, which is indicated by the opacity of the two colors. The blended color of reflected or transmitted light shown in the graphic could be more red or more yellow than the incident light, in accordance with the Fresnel equations showing the difference of power reflection and power transmission coefficients in two light beams. We can observe directly that the closer the incident angle is to the Brewster angle, the more red the reflected light becomes, until there is no yellow light in the reflected light at the Brewster angle. 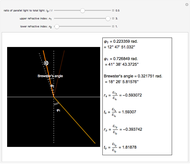 This is consistent with the Fresnel equations for the polarization of light reflected at the Brewster angle. Another interesting thing to try is to move the locator so that the incident angle is close to zero or . You can then observe the cases of vertical incidence and grazing incidence. Moving the three sliders will reveal these differences. This Demonstration can also be used to exhibit Snell's law, relating the angles of incidence and refraction. Han Wang "Applications of Fresnel Equations for Light Intensities"